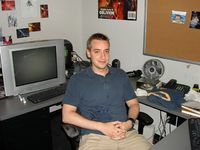 Gavin Carter joined the Bethesda Softworks team during Morrowind's development. His first job was as a designer, but for Oblivion he moved into the role of a Producer. He eventually left Bethesda during the summer of 2009. As an interesting side note, Gavin was the first Non-Bethesda employee to join the Official Forums, and only later got a job as a developer. This page was last modified on 3 November 2018, at 08:27.